The Linksys EA3500, EA4500, E3000, E2100L, E4200, E3200 and E1550 Wireless-N Routers have an additional feature that allows users to insert their USB storage device as additional storage. Users who are connected to these routers will be able to share and access the files in the USB storage. NOTE: To launch Linksys Connect on a Windows computer, go to Start > All Programs > Linksys Connect. To launch Linksys Connect on a Mac computer, navigate to the Applications folder in Go, and then start Linksys Connect. If you need more help, click here. 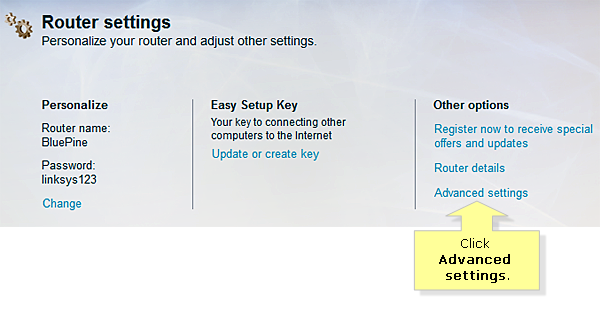 Click Advanced settings in the Router settings page. On the Advanced settings screen, click Copy password and click OK. 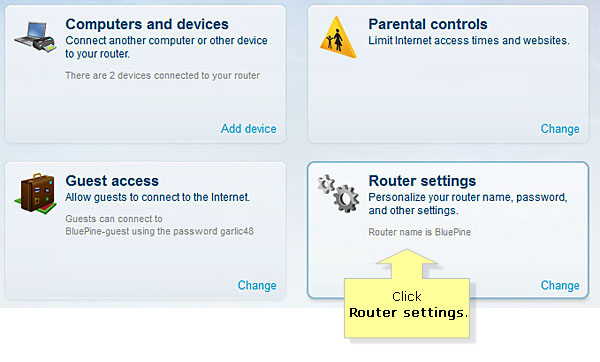 NOTE: This will bring you to the web-based setup page of your Linksys wireless-N router. On the web-based setup page, select Storage and click Administration. You will then see the Administration panel of your USB storage device. You can either Create New Group or Create New User here. 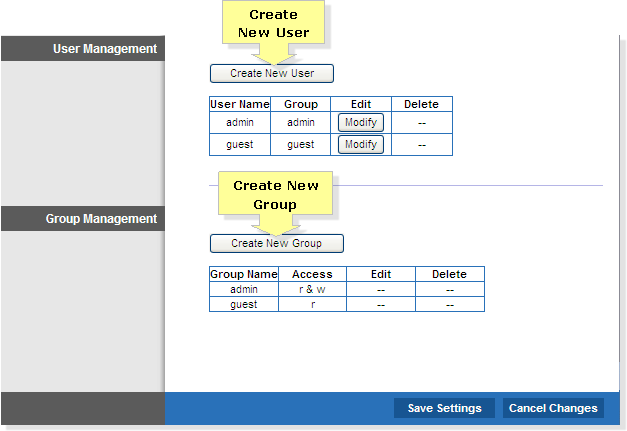 At the Group Management section, click Create New Group. 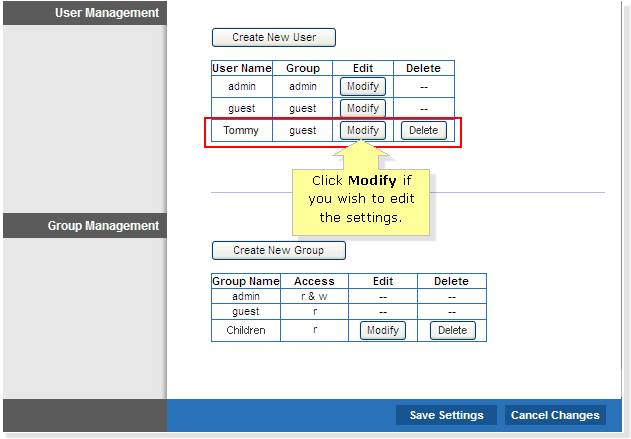 Once a new window opens, enter the Group Name, Description and select the suitable Access for the group. You can set it to any names you want. NOTE: If you set the access to read and write, the group will be able to create files and edit files in your USB storage device. If the access is read only, they can only read the files without editing ability. When you are back to the Administration tab, you should see the group you have created earlier as shown below. If you wish to rename or edit the settings, click Modify. 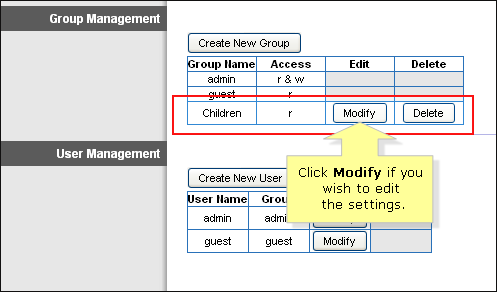 At the User Management section, click Create New User. Enter the Name, Full Name, and Description of the new user in the fields provided. Also, enter a Password for the user and click the drop-down button to select a group for the new user. Then click Create User when you are done. NOTE: You can set a different password for each user account. When you are back to the Administration tab, you should see the new user name you have created earlier as shown below. If you wish to rename, or edit the settings, or change the password, click Modify. 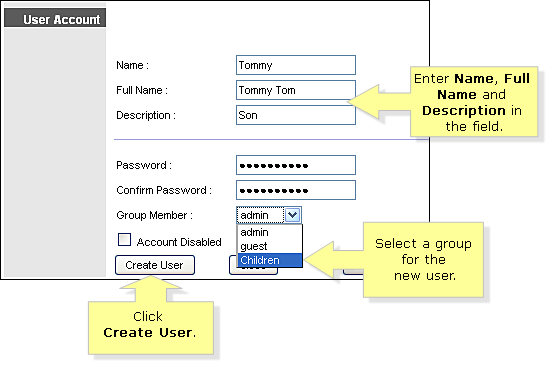 NOTE: In the example above, a new user was added with the User Name “Tommy”. IMPORTANT: If you are using encrypted storage devices, i.e. a hard disk with a password, make sure you keep the password secure. A general rule when creating a password is that it should be something that you will remember but can’t be easily guessed by others.